Our Town reported on the 2016 results from the Bike Safety Program. The results include a nine-fold increase in enforcement year-to-date with 1,865 summonses issued to bicycles, last year 200 summonses issued by the 19th precinct. 1,450 violations for not giving right of way to pedestrians, among other violations. 36 Environmental Control Board (ECB) summonses issued. 15 motorcycles have also seized. Since the summer of 2015, the bike safety program has succeeded in its goal of helping pedestrians and cyclists safely enjoy city streets, as covered by CBS, NBC, Our Town and amNY. Following last year’s Bike Safety program in August, the NYPD’s 19th Precinct reported a year-to-date 15% decrease in bike and pedestrian collisions. 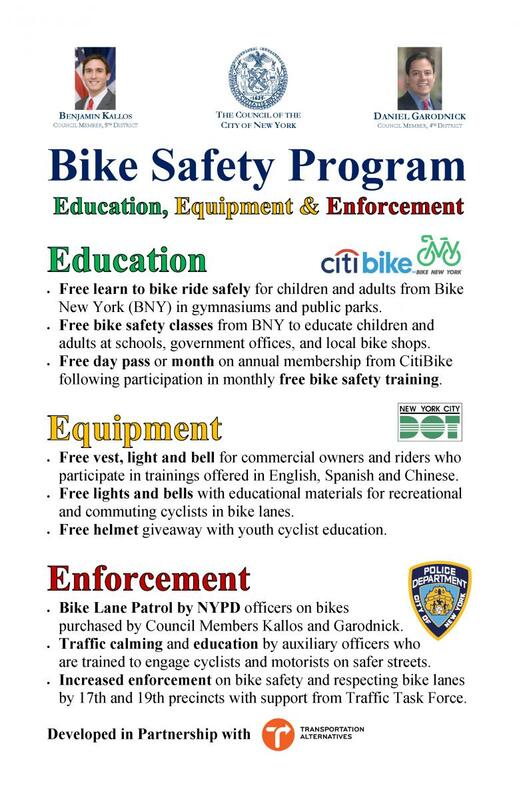 Free vests, lights and bells for commercial owners and riders who participate in trainings offered in English, Spanish and Chinese with 200 trained in 2016. Free lights and bells with educational materials for recreational and commuting cyclists in bike lanes including 4,830 bells and 2,492 lights distributed citywide with 580 bells and 300 lights distributed on the East Side in 2016. Free helmet giveaway with youth cyclist education with 165,000 distributed since 2006 and over 400 distributed on the East Side in 2016. Protected bike lanes, which began with First Avenue and will expand to Second Avenue in 2016, have reduced in all vehicle, bike, and pedestrian collisions by as much as 43% at Ninth Avenue between 16th and 33rd Streets. Enforcement against restaurants that deliver by bike with inspections for safety equipment such as vests, lights and bells with issuance of warnings or summonses in response to 311 complaints.